I hope you all had a wonderful Thanksgiving. Mine was okay – I cooked for 8 people and then got up the next morning and did some Black Friday shopping and am now approx. 75% finished with my Christmas shopping. My goal is to be completely finished by the 15th so that I can enjoy the rest of the month making cookies with my kids and watching Charlie Brown Christmas and Elf and It’s a Wonderful Life instead of stressing about how much I still have to do. That’s the plan anyway. Like my post title implies, I have been very productive lately. The Christmas shopping was just the start. I also dragged out all of the Christmas decorations and got the tree up and decorated as well. I also finished AND mailed my Pay It Forward gifts (finally!) and also mailed the coupons for the PopChips giveaway. Work has been crazy since we are implementing a new data entry system tomorrow and my location is going to be the first to go live with it, so I’ve been actually working while I’m at work. All of this is to say that unfortunately when life gets busy, blogging gets forgotten. 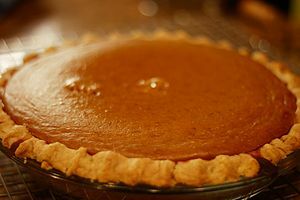 You can be for damn sure that next year, there will be pumpkin pie. Oh yes, there will be pie. In other news…I have no other news. Really there just isn’t a whole lot going on that I feel the need to blog about. About which I feel the need to blog. I know the second sentence is grammatically correct, but it feels foreign to say it that way. Sorry grammar nazies. Is the plural of Nazi, Nazies? Or is it just Nazis? Personally I don’t they deserve any extra letters at all, so I’m sticking with Nazis. Damn Nazis. Yeah, anyway, I need to get back to work. The boss will be back any minute and my new 22″ monitor that I just got for the new data entry system (I don’t know why they sent me a new monitor, but hey, I’ll take it!) doesn’t hide things very well at all. I’m totally going to have to rearrange my desk so that only I can see my monitor. Sneaky sneaky!! Okay, so anyway this is me getting back to work. Thanksgiving without pumpkin pie. That’s not right. Even though I miss your clever blogging I am glad that you life is getting in the way because its going well. That’s the second time someone has mentioned the Costco pumpkin pies. I might have to give them a try. I laughed so hard at your rant. I offered to bring mini pumpkin cheesecakes and totally bit off more than I could chew that week (because I cooked for 3 nights straight after work and the 3rd night I was BURNT) and so my husband emplored me to just let him grab us a pie at the pie shop. so my pecan fail dessert (which I really wanted to try) never got tried and the gang ate some chocolate torte (that was really good) and the hosts home made apple pie. so maybe next year I’ll say I’m bringing a store bought pie so I can function and work and be a mom and deal with it and maybe instead do a fancy thing. sorry you didn’t get pumpkin pie. that stinks. ps our office went Live with a new computer system that we spent 2 years developing and it was NOT FUN. get rest! doubling up on your work??? we did. boo. I need to go shopping. I feel like a slacker now!